Many French Entrée readers will be planning to move to France, probably on retirement. At that stage it is likely that they will need to rely heavily on that pension to provide a regular income. Many of you have contributed regularly to a pension scheme, or schemes, during your working life in order to be able to enjoy your retirement free from financial worries. For this reason it is important to get the maximum possible out of your hard paid for pension. When the time comes to take your pension you will have a choice as to how you receive those funds. Financial planning is an important issue for retirees, especially if you are moving abroad, and how you take your pension should form part of this strategy. UK pensions can be restrictive. There are regulations which prevent you from taking all of your pension money at a time that suits you to use as you wish. There are restrictions on when you take your benefits and usually you have to buy an annuity when you reach 75 – it used to be earlier. The UK government set these restrictions to prevent people from squandering their pension pot and then having to rely on the State. Unfortunately this means that if you were to die before you were able to enjoy the full benefit of your pension, its value is lost, for you and for your heirs. Now, much of that has changed for the British expatriate. There is an exciting new international pension scheme available that permits UK non-residents to transfer their pensions out of the UK and the advantages are indeed attractive. A Qualifying Recognised Overseas Pensions Scheme (QROPS) is accessible if you are planning to move abroad, or have already left the UK, and have notified HM Revenue & Customs (HMRC) that you are no longer a UK tax resident in the UK. You must then remain a UK non-resident for five consecutive UK tax years before being completely removed from UK rules and taxation on your pension. You can transfer your pension into a QROPS as you leave the UK, or at any time after you have left and you do not need to wait five years before doing so, though the full benefits only start once the five years are up. Many people have a period of travelling after they leave the UK and before they establish a new residency. During this period of being a “fiscal nomad” there are valuable tax planning opportunities. If you have already been a UK tax non-resident for say, two years, you can transfer your pension into a QROPS, where it needs only to remain for three more years. If you have been UK tax non-resident for five years, you may transfer your pension into a QROPS and then immediately out again, free of UK tax. You may decide to place the funds into another retirement plan, or a structured portfolio possibly, under the umbrella of a trust, or take it all as cash. The QROPS must comply with HMRC’s reporting requirements and UK rules as to how and when benefits are taken during the qualifying five years, after which UK tax legislation no longer applies. However, once you are French resident, taxable withdrawals from the pension fund will be liable to French tax at the progressive income tax scale rates of up to 40%. Taxable pension income consists of gross income less a 10% deduction, with a minimum of €352 and a maximum of €3,446 per household in 2007. Pension income is also liable to social charges at 7.1%, unless you hold either Form E106 or E121. If you decide to take all of your pension in cash as a lump sum from a QROPS there is no tax liability in France on the withdrawal from the fund, but the cash will form part of your assets for wealth tax purposes. If you choose to take all of the value of your pension from a QROPS in cash, you could invest it in an appropriate tax efficient portfolio which is treated very favourably for tax purposes in France. There is no tax to pay on rolled up gains or income and if withdrawals are made then only the element of gain is taxed. Currently UK pensions rules state that you have to buy an annuity or a secured alternative pension at age 75. Annuities generally represent poor value and are inflexible. On your death your pension dies with you. 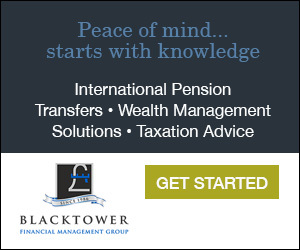 Pension rights transferred into a QROPS are shielded from UK inheritance tax (IHT). Within a QROPS your heirs are able to inherit the remaining balance of your pension fund without it being diminished by UK inheritance taxes. You can also designate who you wish the beneficiaries of the fund monies to be – free of the restrictions of probate, often a very lengthy process. You can avoid exchange rate risk by selecting in which currency you wish to take your pension income. It can be taken in Sterling or Euros or indeed, in any other currency to suit your circumstances. QROPS are very flexible as to how and when you take your income. Most types of UK pension schemes qualify – including protected rights – even if you are already taking an income from them. If you have changed employers during your working life, and many people have moved companies several times, you can pool all the different pensions you have accrued for transfer into a QROPS. However, unfortunately you cannot transfer if you have already purchased an annuity or begun to take benefits from a Final Salary Scheme. A UK state pension does not qualify either. The financial adviser you use to give you advice on transferring your pension into a QROPS should have the necessary authorisations and qualifications. Furthermore they should be authorised by the Financial Services Authority in the UK. The company should also be authorised to give advice in France via the Insurance Mediation Directive and have Professional Indemnity Insurance. If you were to receive advice from someone who was not a correctly authorised adviser, you may not have any recourse with any regulatory body or be able to claim compensation if matters were to go wrong. The QROPS provider must have official QROPS status and meet HMRC’s rules and standards. There are only a handful of QROPS suitable for retired UK expatriates. Some QROPS providers state that you must be resident in the country where the QROPS is located while others will only accept certain types of pensions. Not all QROPS are approved by HMRC and it is essential that you do not transfer into an unauthorised scheme.